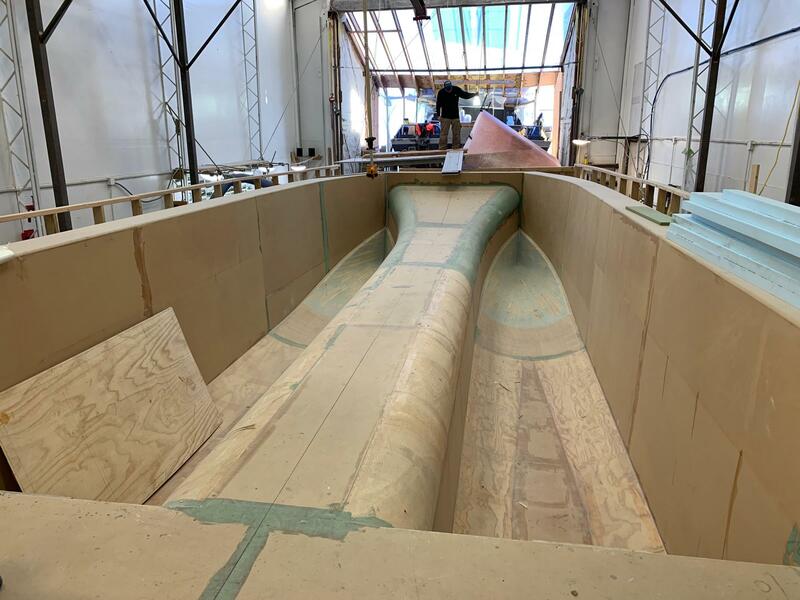 The mold of a 37-foot catamaran sits in Eric Sloth's boat shop in Homer. The federal government’s partial shutdown shows just how important basic government operations are to Alaska’s coastal communities. Most U.S. Coast Guard operations are suspended and that’s holding up commercial boat and permit sales as well as some construction of passenger vessels. Bowen facilitates the sales of all types of boats, but commercial fishing vessels are his bread and butter. However, fishermen trying to buy or sell those vessels are hitting the same wall. Coast Guard registration is much like an automobile title. It details not only who owns the boat, but if there are any loans taken out on the vessel. Most commercial fishing vessels are required to be federally registered. That means the boats Bowen sells can’t officially change hands during the shutdown. Sales that weren’t complete before the shutdown began are on hold as well. Commercial fishing permit sales are also affected. They can cost thousands of dollars and fishermen commonly put their boats up as collateral on loans to finance them. It’s also common on loans used for major repairs to vessels. But without a recent copy of a boat’s federal registration, private and state lenders often won’t move forward. That’s the boat Homer-based fisherman Larry Reutov finds himself in. Reutov hoped to use his vessel to secure a loan for new engines he needs by the March fishing season. He’s considering putting his house up for collateral, but he’ll need to decide soon – the work will take more than six weeks to complete. Boat builders are also feeling the pain of the shutdown. Passenger vessels such as large fishing charters and ferries are required to be inspected by the Coast Guard from the planning phase of construction to the day vessel touches the water. Eric Sloth’s shop in Homer is filled with a mold for a 37-foot power catamaran. Sloth said the boat isn’t due to be complete until the spring of 2020, but every week the shutdown lasts is another week he can’t start the long process toward the finish line. That may just happen in some respects. Alaska Sen. Dan Sullivan introduced a bill Tuesday that would provide pay for active duty Coast Guard members and payments to its retirees. Correction: A previous version of this story mischaracterized a bill Alaska Sen. Dan Sullivan introduced regarding pay for Coast Guard members during the shutdown. It will provide pay for active duty Coast Guard members and payments to its retirees. Photo Courtesy of Holland Dotts & the Alaska Marine Conservation Council. The partial federal government shutdown has left some Alaska fishermen and others wondering whether federal fisheries set to start in January will open on time. The National Marine Fisheries Service has been affected by the shutdown and many employees aren’t there to answer phones, leaving some with more questions than answers. Albert Duncan with the National Oceanic and Atmospheric Administration’s law enforcement office said his division is still running during the shutdown.